No doubt EMD has experienced a challenging few weeks with emerging currencies and EM credit spreads all falling in value when measured in US dollars. Ongoing trade war rhetoric with China and an unexpected strengthening in US sanctions against Russia have been amongst the headlines whilst rising US Treasury yields and a stronger dollar have challenged risk appetite. However, we feel the sell-off reflects mainly technical rather than fundamental factors. The sell-off has largely been driven by investor positioning. Global investors had built up extreme short US dollar exposure versus both developed and emerging market currencies, with dollar shorts reaching a seven-year high. At the same time, strong inflows into hard currency EM sovereign debt in recent months – including some from non-specialist EM investors – resulted in stretched EM exposure to the asset class, the reversal of which contributed to the technical correction. We see few obvious catalysts for further medium-term dollar strength and US Treasury weakness. Fundamentals remain relatively strong with growth robust, inflation contained and current accounts, on the whole, relatively balanced. Valuations even before the sell-off were far from stretched. Indeed, the recent sell-off should encourage further inflows into an asset class that offers significantly more value now than a few weeks ago. Exploring each of these in more detail. With 2-year Treasuries at 2.5%, we believe the sharp repricing in the short end of the US Treasury curve has largely played out. Market expectations are now more closely aligned with four expected Fed rate hikes this year. The outlook beyond 2018 will depend very much on the inflation outlook. While we are seeing core inflation around the 2% target, there is little upside in the near term from here (Figure 1). In addition, consensus forecasts show limited overshooting into next year. Our modelling also suggests wage inflation should roll over in coming months. Econometric modelling is inherently imperfect and not a reliable indicator of future results. Source: Bloomberg, Haver, Investec Asset Management, May 2018 Nowcasting models are used to predict short-term economic dynamics. Nowcasting estimates are based on our proprietary dynamic factor models using third party data. These models are only utilised as part of the team's wider investment analysis. While the dollar may strengthen further over the very short term, nothing has changed to make the currency look less overvalued on a more structural view – this is a country after all heading towards a 5% fiscal deficit and a 4% current account deficit in 2019. Foreign holdings of US assets are also stretched, with the country’s net international investment position near all-time lows – most of this is in liquid bond and equity investments. The flip side of the strong dollar is euro weakness, in part due to concerns about euro-zone economic activity. We think these concerns may be overdone after a tough March, due to the impact of cold weather. Euro-zone leading indicators have generally firmed at strong levels, after falling in the previous month from extremely high levels. Global growth remains on a relatively strong path with a synchronised upswing across developed and emerging markets. Some signs of global weakness in the first quarter largely resulted from transitory factors such as cold weather in Europe and the timing of Chinese New Year. For instance, our China growth nowcast (Figure 2) points to near-term stability around target. Source: Haver, Bloomberg, Investec Asset Management, May 2018 Econometric modelling is inherently imperfect and not a reliable indicator of future results. 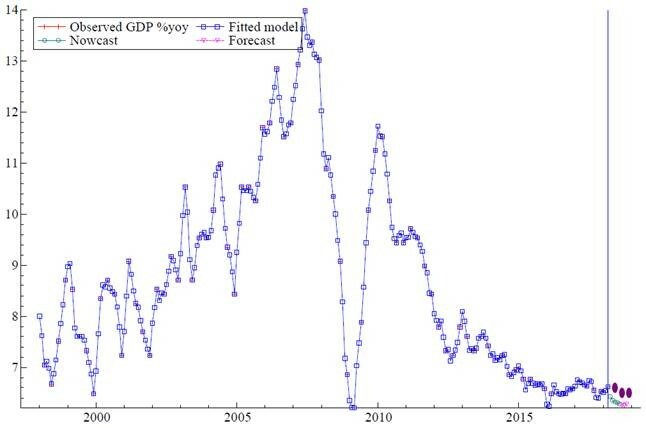 Nowcasting models are used to predict short-term economic dynamics. Nowcasting estimates are based on our proprietary dynamic factor models using third party data. These models are only utilised as part of the team's wider investment analysis. 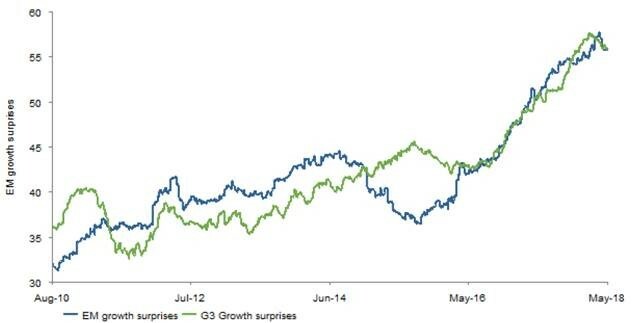 True, growth surprises have begun to moderate, but this comes after an extended period of upside surprises (Figure 3). Overall leading indicators remain consistent with strong levels of emerging market economic growth. Inflation surprises have been ticking lower across emerging markets over the last month. This has kept local yields relatively stable, with a healthy real yield buffer offering continued protection (i.e. local yields can fall even in absence of further disinflation). 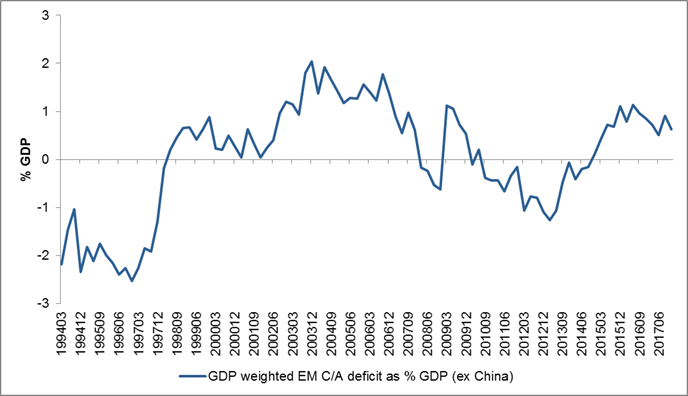 Emerging markets have become much less vulnerable to external shocks and so we feel comparisons to the taper tantrum and the like are not entirely relevant. Current account deficits have, on the whole, been reined in significantly over the last couple of years and on some measures are in surplus (Figure 4). In the near term, aggregate EM terms of trade remains supportive given relative strength in commodities in particular. This should help underpin spot EMFX returns over the medium term. Healthy growth and resilient current accounts are helpful from a credit perspective as well. We are also seeing many governments move towards fiscal consolidation and there are structural reforms underpinning credit dynamics in more vulnerable economies. Improving credit trends are also apparent at the corporate level. Deleveraging and stronger revenues have helped drive improving credit rating momentum. Indeed, over the last few months we have seen more corporate credit rating upgrades than downgrades for the first time since 2012. The improving fundamentals story is not universal, and there is clearly a differentiation in outlook for some countries with specific idiosyncratic concerns, such as Argentina and Turkey. However, on the whole fundamentals remain on a strong and improving trajectory. While a prolonged period of currency volatility may start to impact fundamentals, the current sell-off has shown little sign of transmitting into economic fundamentals. With low EM inflation and high real interest rates on the whole, the impact on financial conditions has been modest. As Figure 5 shows, there has been limited impact on EM financial conditions. 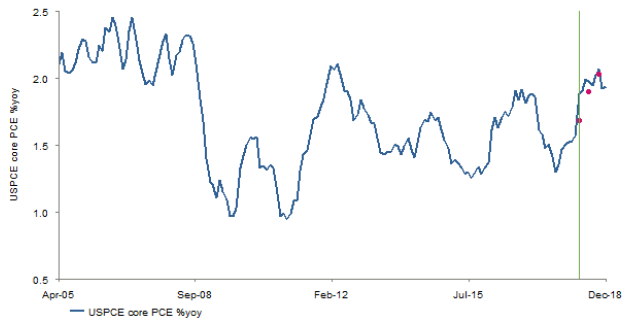 We would be more concerned if we were to see a tightening (e.g. a drop in the index). We felt there was value in currencies before the recent weakness given the constructive and intact fundamental backdrop. Given the recent sell-off, we feel that emerging market currencies offer even greater value. This is demonstrated in Figure 6 below, where the green line indicates how the short-term value opportunity has improved as a result of the currency sell-off whereas conversely, the blue-line shows improving Terms of Trade (ToT) for emerging markets. 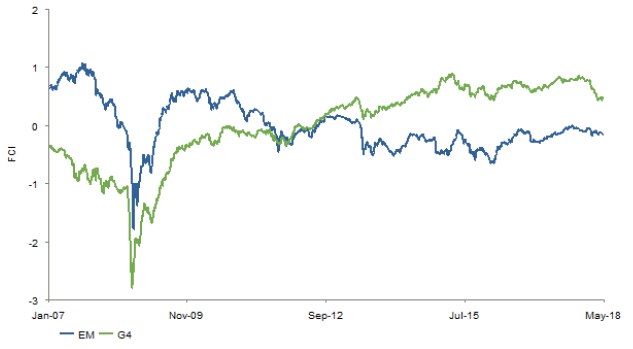 The divergence in this relationship usually normalises in the medium term. 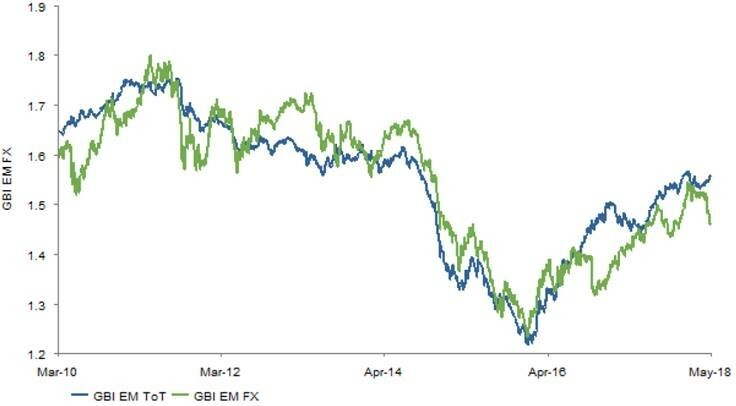 * Currency index JPM GBI-EM local bond spot FX returns, terms of trade index weighted with GBI-EM country weights. Local currency yields have proven resilient during the weakness, helped by a relatively benign inflationary outlook across most of our markets and a reasonable real yield buffer. Thus we feel there is significant value in EM local currency debt, with yields above 6% and value in currencies, buoyed by a supportive growth and inflationary outlook. The back-up in both sovereign and corporate EM credit spreads is also opening up greater value in hard currency debt. Hard currency sovereign spreads in particular have underperformed, with value opening up compared to other credit markets such as US high yield, which outperformed in April. While there have been outflows from the asset class, we expect this to be short lived given the improved value and the fact there is still US$9 trillion in negative yielding developed market sovereign and over US$500 billion in negative yielding euro credit. In conclusion, we think the EMD asset class should still offer significant return potential for 2018, on a more structural basis. In particular we are optimistic about local currency debt, where there is significant room for currency appreciation and a decent real yield buffer.